In what's been an extremely busy last couple of months for me (two comic book conventions, a solo art show, several Dia de Los Muertos events, teaching new comic book workshops and doing the occasional batch of laundry! ), there are two more major events coming up this weekend. 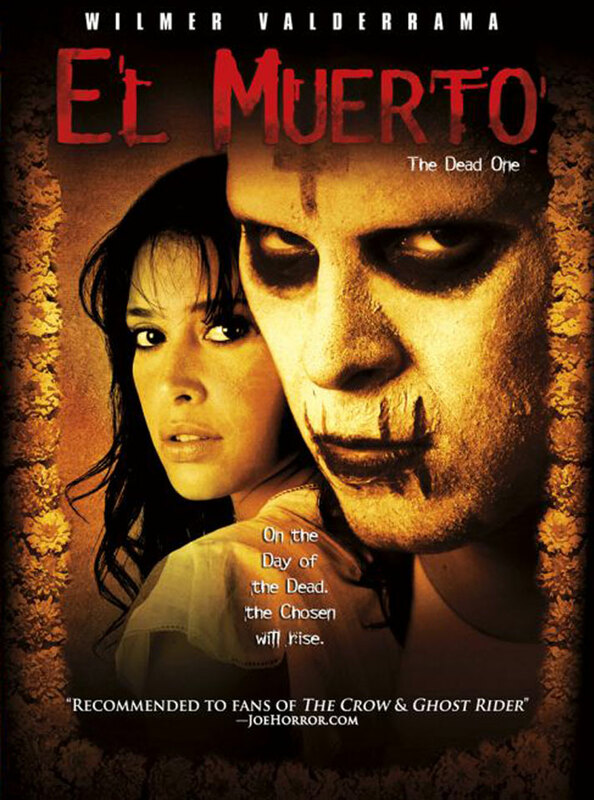 On Friday, Oct. 29, EL MUERTO will the the Opening Night feature for the Fear Fiesta, a new film festival which spotlights Latinos in horror movies. The festival takes place at CASA 101 THEATER, a non-profit organization providing cultural & educational programs in theater, digital filmmaking, art and dance to East Los Angeles residents. Following the screening, there will be a Q&A with myself, producer Larry Rattner, and screenwriter/director Brian Cox. The film begins at 8:00 pm, but I'd suggest getting there at least a half hour early to get a seat. Admission for the screening is FREE! Here's the entire schedule for the 3 day event, featuring more movies and panels, an art gallery, and a children's event on Sunday (which I'll be there for as well). CASA 101 is located at 2009 East 1st Street, East Los Angeles, 90033. 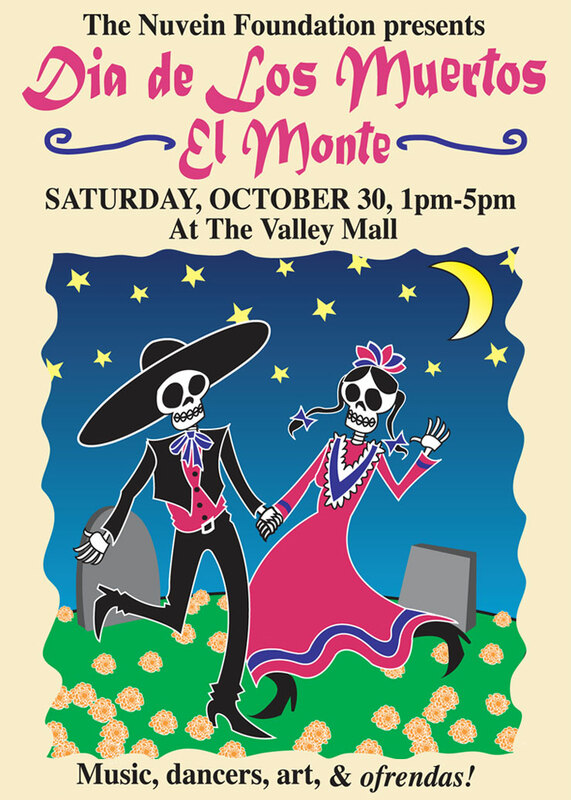 On Saturday, Oct. 30, I'll be at the DIA DE LOS MUERTOS EL MONTE event, organized by the Nuvein Foundation. It's El Monte's first Day of the Dead event, and as one of the Directors of the Nuvein Foundation, it's very exciting to be launching what we hope to be an annual tradition. The event is FREE to the public, and will be held from 1pm-5pm. The event will be held in the parking lot located off of Valley Blvd, between Granada Ave and Monterrey Ave. Here's a map of the area. There will musical performances including Martin Espino, Tina Flores & her Trio, folkloric dancers, dramatic readings by Christopher Trevilla and more. 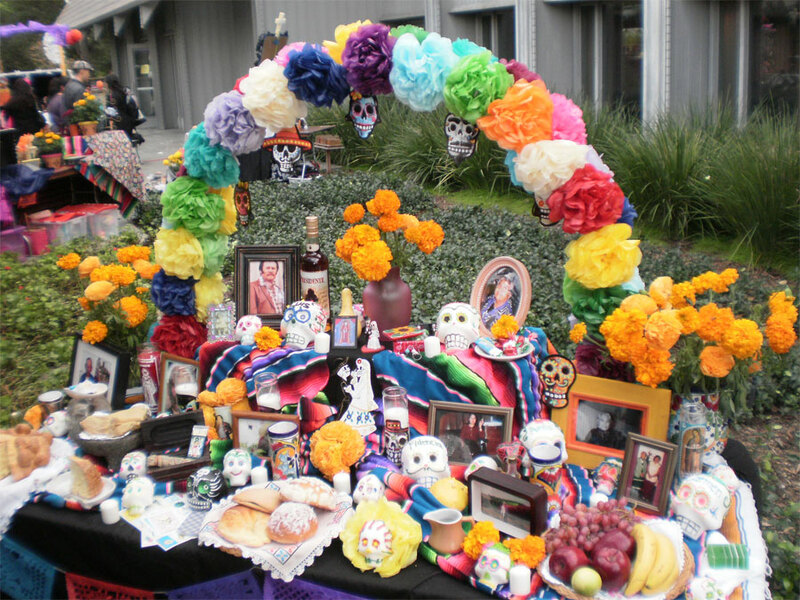 Also, there will be altars by local High Schools and an art show in a U-Haul truck curated by Grasiela Rodriguez! 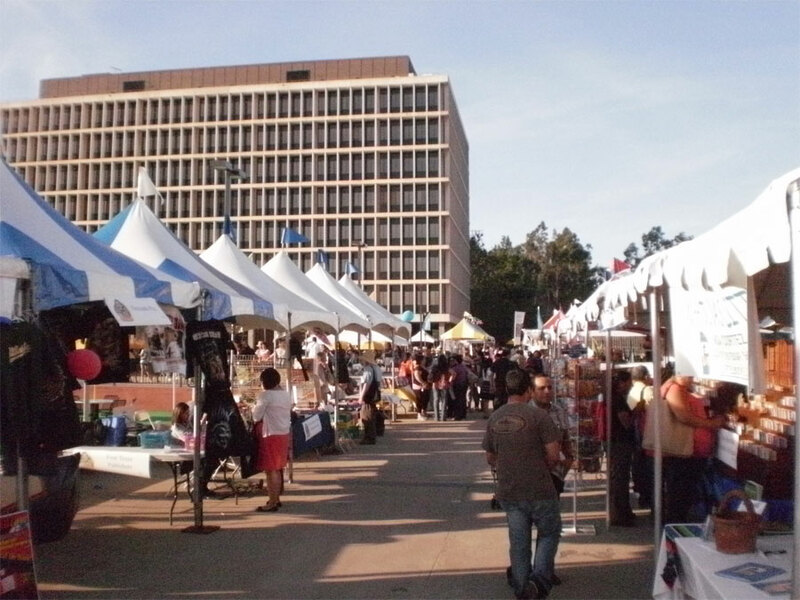 Plus lots of food vendors and artists selling their works. 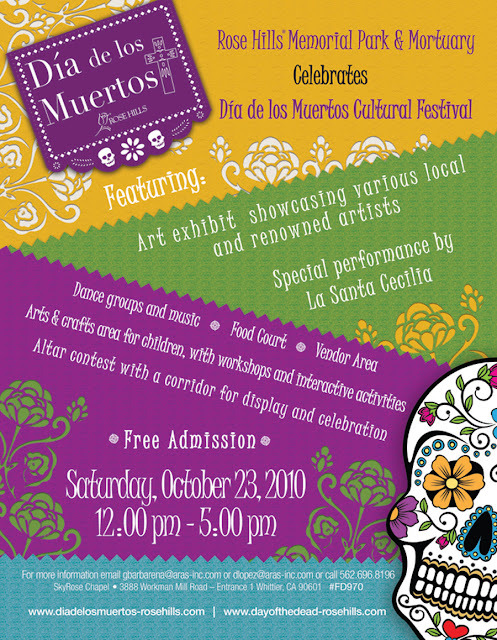 And yes, I'll be there with the full Muerto catalog! It's a very busy month in LA for sure. With the normal hoopla over Halloween this weekend, and the explosion in Dia de Los Muertos celebrations that seems to have erupted this year, there's so much to do. But hopefully I'll see you at one of these events. Looks like I may be due for some time off next month, no....? 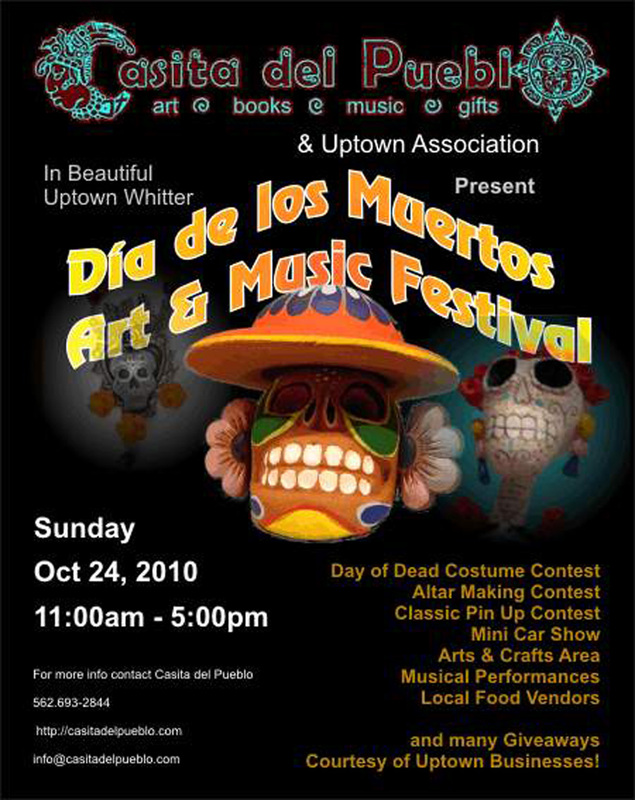 Yesterday, Sunday the 24, I spent the day at the Uptown Whittier Dia de Los Muertos festival. They've been running this for a few years now, and this is the first time I've signed here in a couple of years. 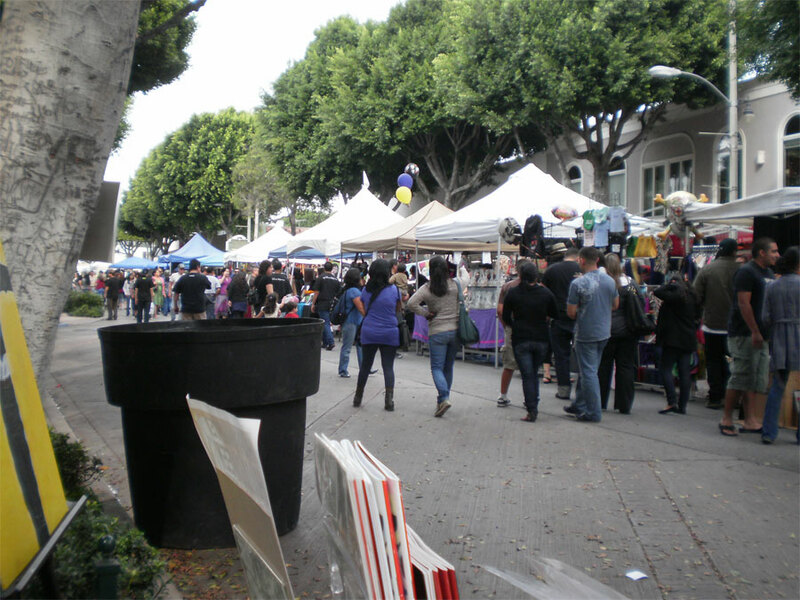 They closed off two blocks of the main street, Greenleaf Ave., and had artist booths, food vendors and music to help celebrate the occasion. 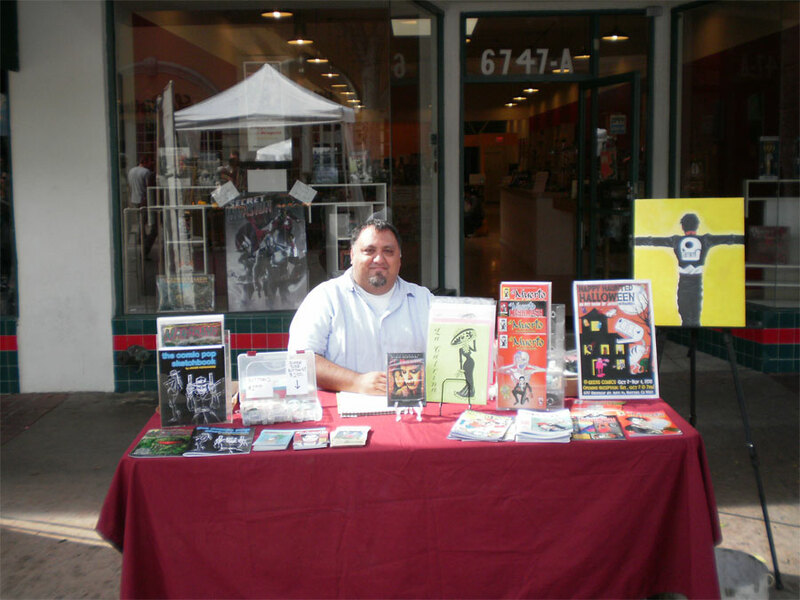 I was stationed in front of GEEKS Comics, right on the sidewalk, courtesy of my good friend Sal Felix. 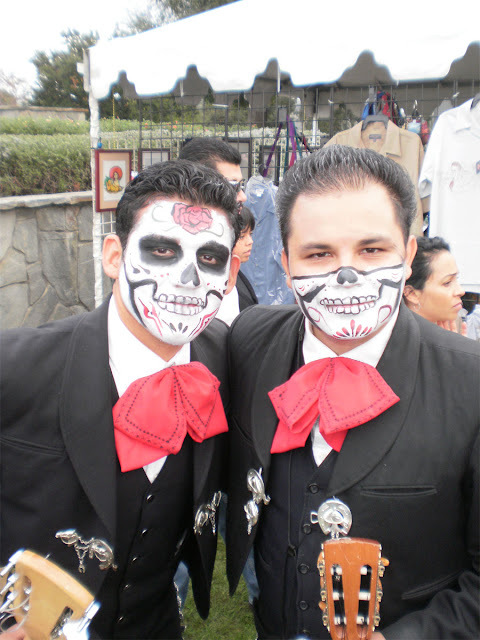 One thing that became clear to me, not just this day but at Saturday's Dia de Los Muertos event in nearby Rose Hills, was the amount of saturation the film EL MUERTO has made in the general public by now. First released on DVD in 2007, the film, always an independent underdog, has had an extremely long life on cable. I had various people stop by my tables both days and mention that they had seen the film on television, some had even caught one of the local screenings we had played at a few years ago. Obviously your standard Hollywood film gets a wide release and usually is known by a certain percentage of the public. But our independent film EL MUERTO seems to have built up a slow but gradual audience in it's time. While I always assumed this would be the case, to have these encounters with people still catches me by surprise. I had one guy stop by and recognize me immediately. Apparently, he had interviewed me back in 2003 for his college newspaper (or it may have been High School). He mentioned that at the time I had talked about getting a movie option, and now years later he sees me selling the DVD of the film. I'll often meet up with people who had met me years before at an event, and then years later we catch up once again. Things like that don't make me feel necessarily older, but they do remind me that what I do, my life as an artist, is such an integral part of my existence, like getting up in the morning and brushing my teeth. Ah yes, good ol' Greenleaf. When I look at this photograph, I look at those trees and realize they must be the exact same trees that were there back in the 70s, when my parents would take me and my siblings to Ambrose Pizza, the 'best pizza in the world' I would proclaim with all the authority of a 10 year old. When I was in my early teens, I would ride my bike to Greenleaf and spend a day visiting the numerous books stores, both for new books and used books (mostly comics, actually). Bookland, just a few doors up from where GEEKS is now, has been closed for probably 10 years or so. 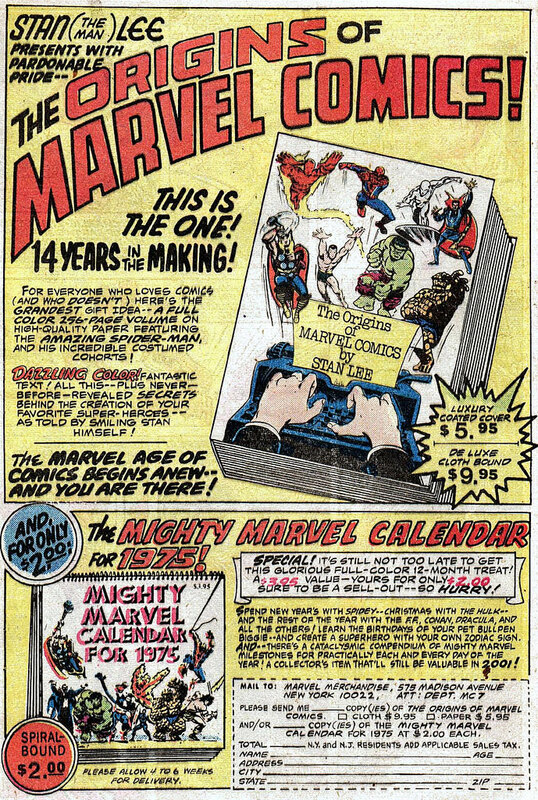 But I used to go there and buy my new comics when I wanted to see what was available beyond the spinner racks at the supermarkets and 7-11 stores I'd normally buy my books at. Besides Bookland, there were about 3 used bookstores on Greenleaf and the surrounding streets. The Little Old Bookshop, Ames Used Books and one other store. All of them had small sections set aside for used comic books, dating back about 5 or 10 years. Just digging through those little piles of comics was such a treat, never knowing what you would find by flipping through the issues. That was my Ebay back then, without the Paypal fees! Sometimes I'd find some books from the 60s (the ancient stuff! ), and slowly build up my collection and knowledge, of the characters and equally important to me, the creators. In the 1984, one afternoon after High School, I discovered that an actual comic book store had opened..in Whittier, on Greenleaf. The Fortune Bookie, owned by John Franco (who later on became a good friend of mine). To have finally been able to walk into an honest to gosh comic book store as a High Schooler was just a milestone! Plus John also carried movie memorabilia, which worked out well for me (and him too!) as I was becoming a huge James Bond film fan and picked up a cool A VIEW TO A KILL teaser poster at the shop. There was a time in the late 80s that Hollywood came to visit Greenleaf. They actually filmed several scenes of MASTERS OF THE UNIVERSE there, and me and my friend Rick O'Neil would hang around the evenings and watch the proceedings. Skeletor's spaceship was hovering over the streets of Whittier those evenings, and it was a total trip to have been there when it happened! Flash forward years later, to about 2004 or so, and I find myself working for John Franco at the latest incarnation of his store, The Hobby Connection. I was between jobs, and for about 8 months or so I worked as a salesclerk in the comic shop. I actually enjoyed the experience, as it gave me an insight into the comic book world I hadn't yet experienced, the comics retailer angle. 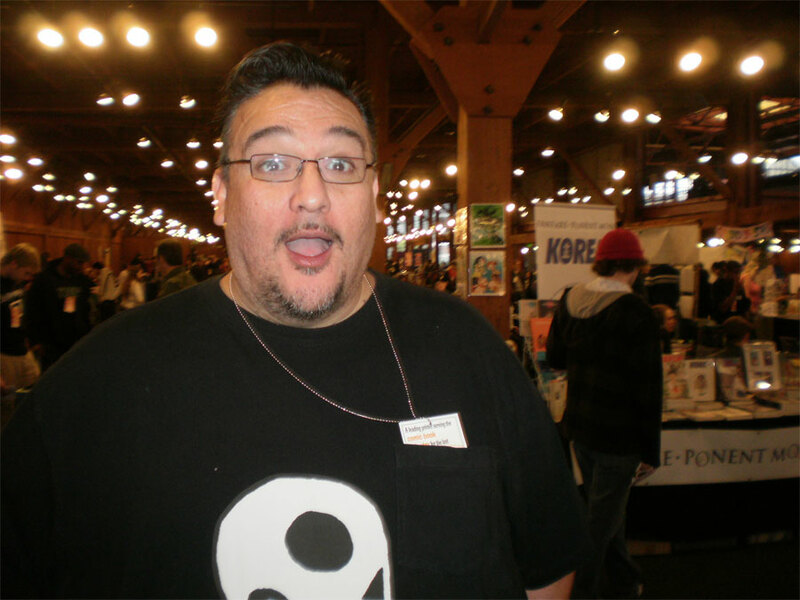 By now I was already publishing my own comics books, and having been a fan, and buyer of comics, working as a retailer was another rung on the ladder to being a total comic book junkie! In 2008, I even had the chance to screen EL MUERTO at the Whittier Independent Film Festival, for which we actually won Best Feature! After the screening, we held a Q&A at GEEKS Comics with myself, director Brian Cox and Co-producer Susan Rodgers. In the last two years or so, either on my own or with other artists, I've had numerous events here at GEEKS. Art shows, live art, seminars, classes. These and all the various experiences I've had along Greenleaf or the surrounding streets adds up to a lifetime of memories. Greenleaf, and the city of Whittier, is named after poet John Greenleaf Whittier, who never set foot in our street or town. But I'm glad to have a well-traveled journey along these streets, and expect to have lots more stories to tell about Greenleaf. 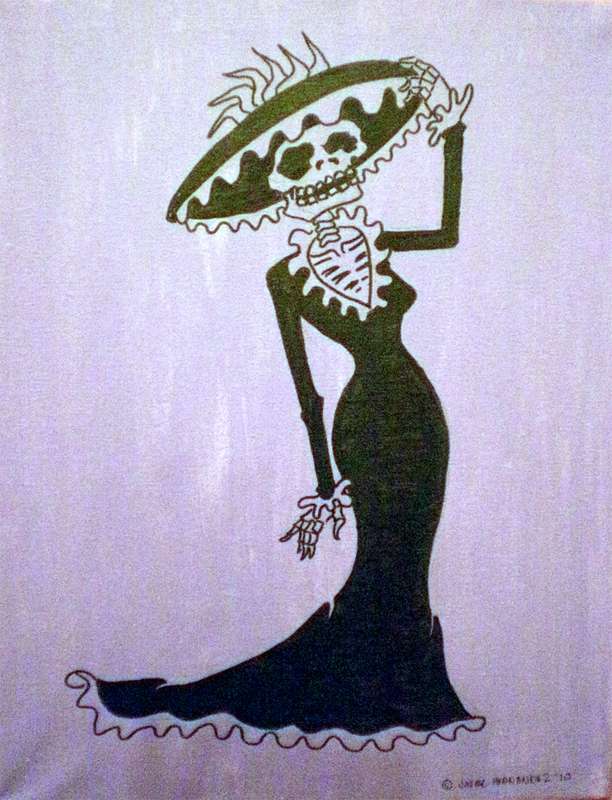 Didn't plan to turn this Dia de Los Muertos event review into an 'Ode to Greenleaf', but there you go. The muse called and I answered. Rose Hills Memorial Park & Mortuary, billed as the world's largest memorial park, held their first ever Dia de Los Muertos event on Saturday, October 23. My friend Janelle Gonzalez (Luna Sol Books) invited me to sign at her booth, and considering Rose Hills is just a few miles from where I live, how could I resist? 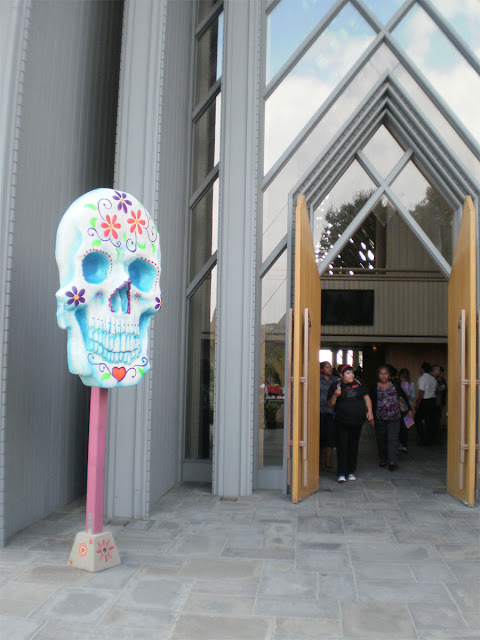 Outside the side door of the chapel was were the majority of the event was taking place. Luckily, while the temperature was cool and cloudy, it never rained, much less sprinkled. 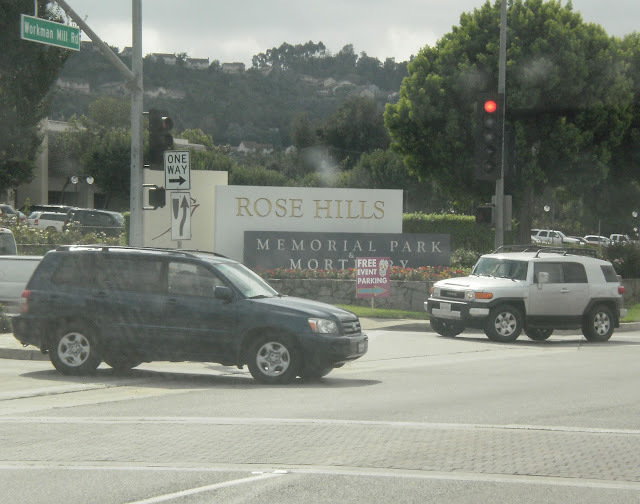 I imagine because of the name recognition behind Rose Hills, there were throngs of people, mostly of the family variety, with lots of kids in attendance. Similar to the feelings I had a few weeks ago at the Latino Book & Family Festival, there was a great sense of culture, history and community in the air. 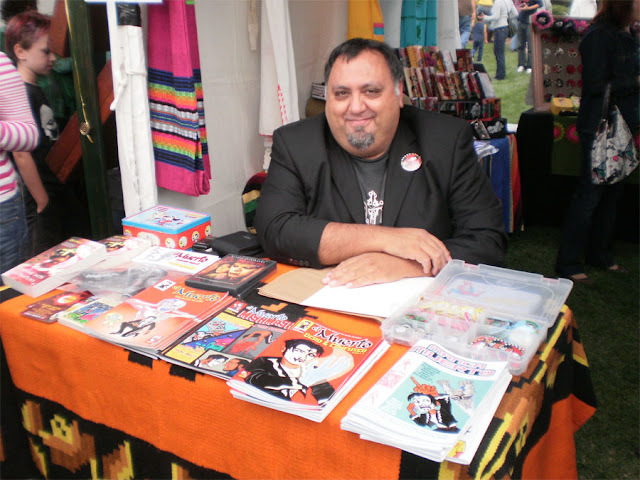 Just last weekend I was up in San Francisco at an independent comic book convention, and now I was in the middle of an event celebrating one of the most unique of Mexican cultural traditions, one on which I took plenty of inspiration from in the creation of my comic book. 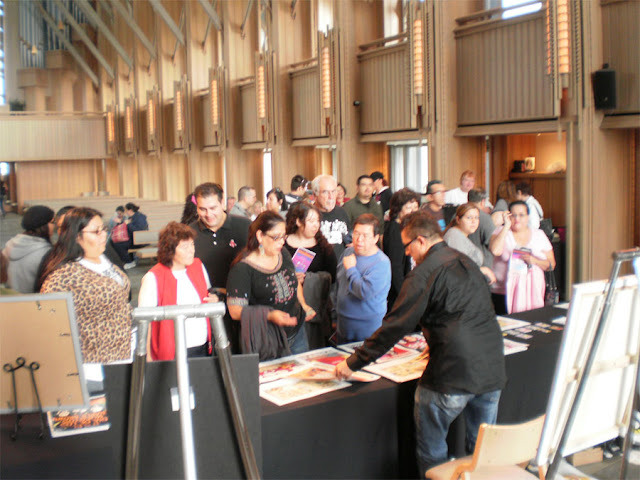 Some of the people who stopped by had actually seen the film on cable or at one of film festivals we exhibited at. I actually had a few people look very surprised to find comic books, as they hadn't read any in years and years. 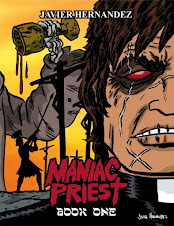 Being the only comic book at an event is very advantageous, and having a comic that specifically intertwines the character's origin directly into the Day of the Dead is even better! I met a lady who remembered me from about 5 years ago when I spoke at a Career Day at a local elementary school, and she asked me for my contact info to invite me back. I actaully told her that I always remembered that event, because when they marched the little 3rd & 4th graders into the auditorium where I was speaking there eyes were starring at me excitedly as they walked to their seats! I think the thing that really stood out to me at this event though was the numerous ofrendas that were on display. 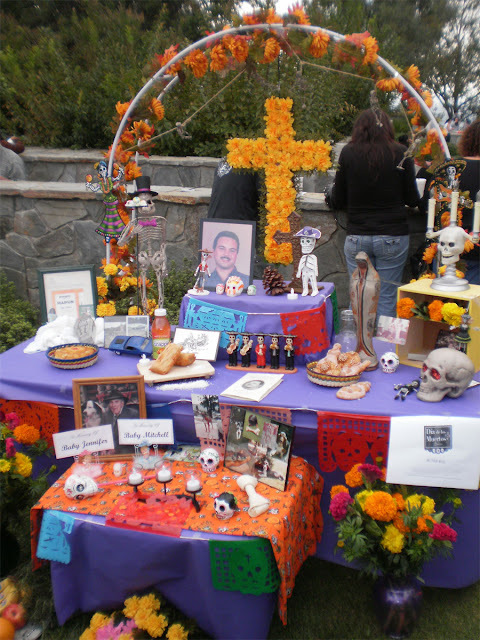 Ofrendas are the altars that are built in memory of loved ones who have died, and really that is the cornerstone of what Dia de Los Muertos is about. 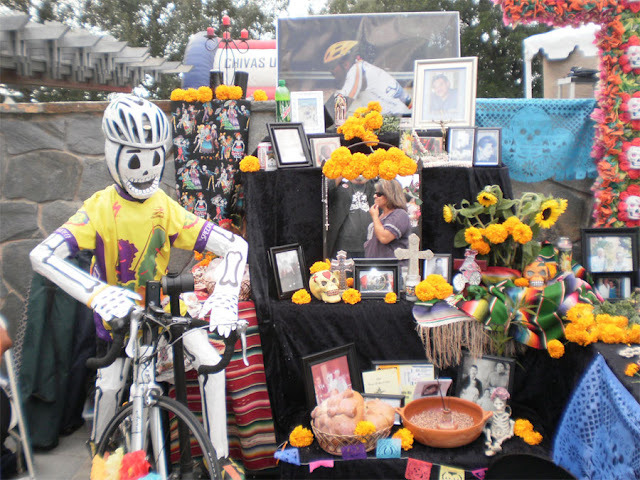 Taking the time once a year to commemorate a loved one with an ofrenda filled with memories and mementos of that person. 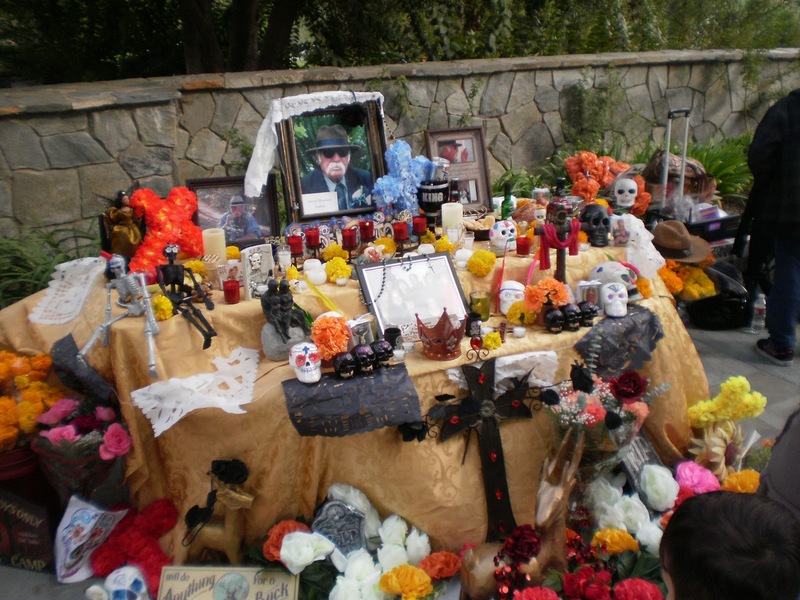 Each ofrenda I saw was very well made, they were simple yet beautiful displays of love. One of my uncles is actually interred in Rose Hills, not that far from where the event was held. 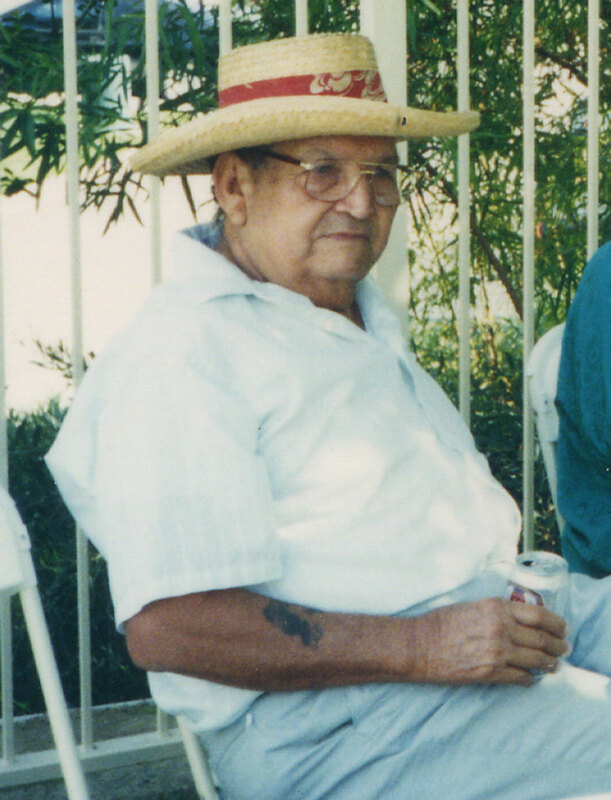 Uncle Manuel passed away in 2007. It was a particularly difficult time for our family because exactly one week after Unlce Manuel's funeral, my Uncle Greg passed away. 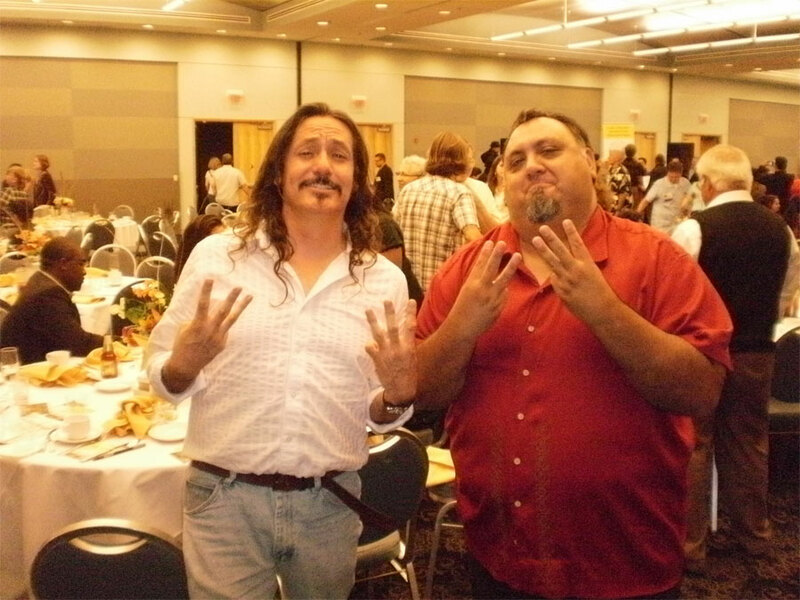 Greg & Manuel were actually the two Uncle's that I was closest to, having lived in our area pretty much all our lives. Manuel was my mother's brother, and Greg was married to my mother's sister. 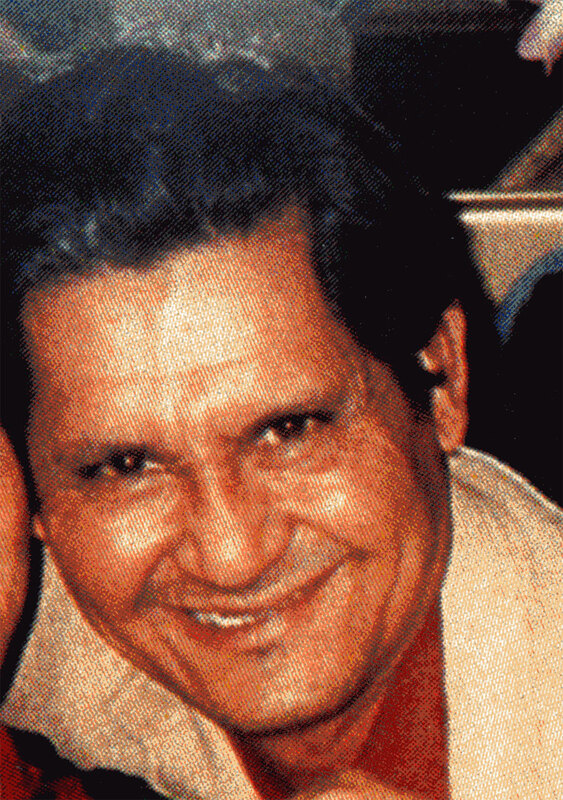 Greg always reminded me of a Mexican Archie Bunker, with a sharp wit and a lovable heart of gold. Manuel was more of a loner, always on the move but always taking time to visit us. I'd like to dedicate today's blog post to their memories. Looking through some old photos of the two of them reminded me how much they're missed. But also, as long as I remember them, they're still part of my life. This Saturday and Sunday, I'll be at two Day of the Dead events in good ol' Whittier, Ca! 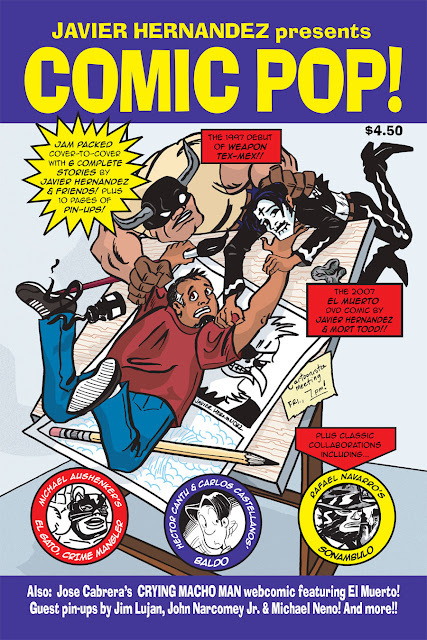 When you're the creator of a comic book character called El Muerto, and you live in Whittier, these are 100% 'No brainers'! 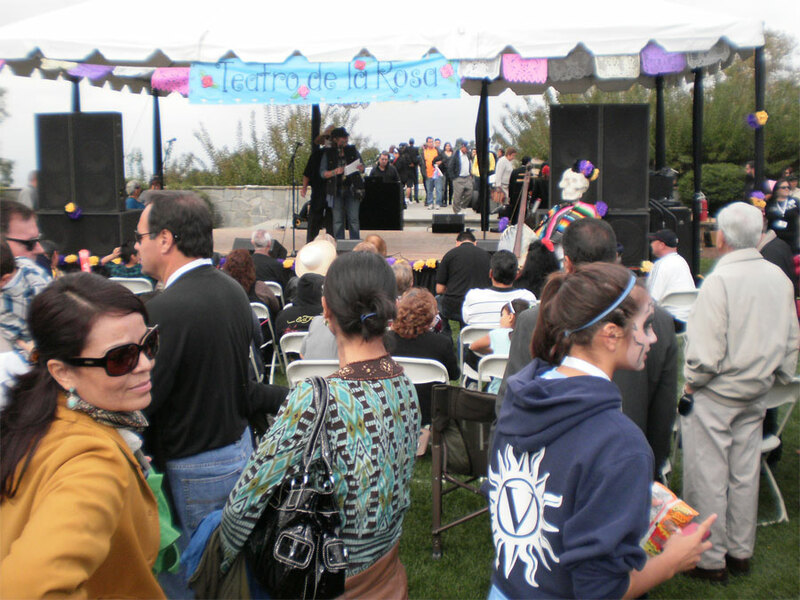 Rose Hills is the largest memorial park in the world, and as this is their inaugural Dia de Los Muertos, I'm glad to be participating. Having grown up around the Rose Hills area, it's very interesting for me to be able to exhibit there, as it'll have a very 'neighborly' feel to it! 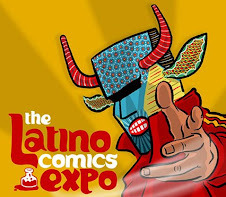 I'll be signing at the Luna Sol Books table from 1:30pm to 2:30pm, hosted by my friend Janelle Gonzalez. On Sunday, October 24, I'll be exhibiting at the Uptown Whittier Dia de Los Muertos event. I'll be there for pretty much the whole event, from 11am-5pm. I'll be located in front of GEEKS Comics, at 6747 Greenleaf Ave, Ste A, Whittier, CA 90601. It's always a treat to be able to attend events in my hometown. Saves wear and tear on the vehicle and keeps fuel costs down! I actually invited all the kids in my local workshops to attend, so let's see if 'teacher' can draw them in (maybe they can get extra credit for buying some books!). This was my 13th APE in a row as an exhibitor, and there was a bit of growth going on at the Concourse Convention Center this year. The exhibit hall was actually expanded for the first time in years. Last year there were 325 exhibitors, with this year the floor map shows just over 700 tables!! 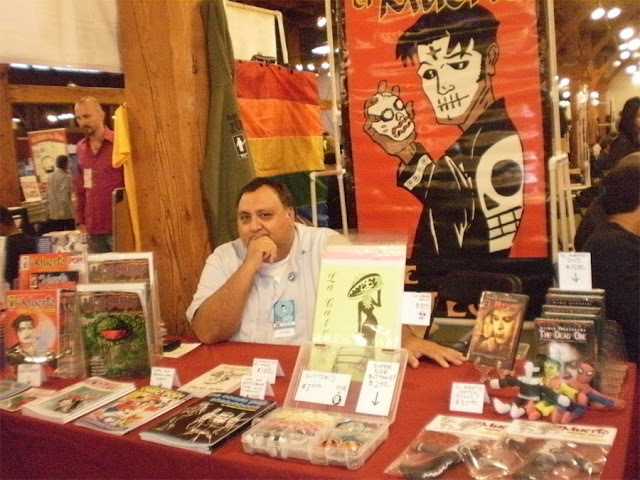 I expanded my table's selection by debuting my brand-new book, COMIC POP, as well as a selection of Muerto Sketch Dolls. New product has always been key for me at APE, having practically debuted a new comic book or mini-comic at each and every show. They're the writer and artist behind ZOMBIE KILL SQUAD, which led to the naming of our corner set-up at APE the Zombie Kill Korner (I just wrote that, we never once called it that the whole weekend!). Positioned directly in front of me was Audra Furuichi, artist of the NEMU*NEMU webcomic. Audra came all the way from Hawaii, and even shared with me some genuine Hawaiin candies she brought! How's that for an overcast, drizzly weekend in San Francisco? Raf and I actually scouted out our first APE together back in 1996, when we had both decided to try out this whole self-publishing thing. We drove up North to meet other artists and exhibitors, find out about table prices and printing costs, etc. Nowadays I guess you'd just Google 'self-publishing', but back in the old days...!! 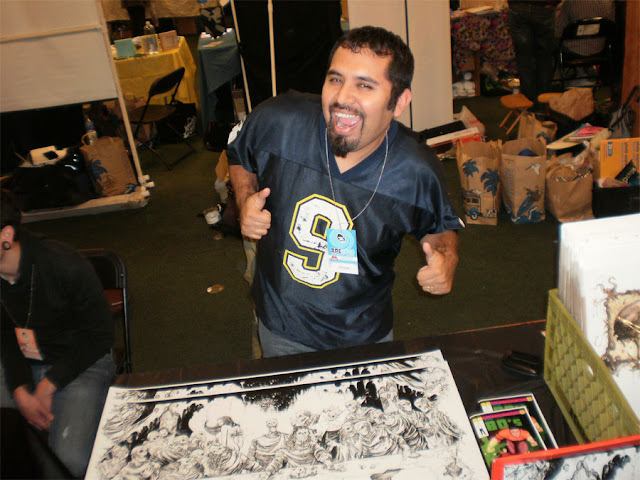 Jim Lujan, the founder of the whole Ghettomation cartoon art form that's sweeping the planet, was actually debuting as a first-time APE exhibitor! Ricardo's a great friend though (outside of his morally questionable act of piracy! ), and was kind enough to host me at his home. 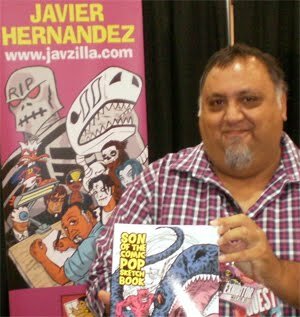 He actually curated my solo art show earlier this year, "COMIC POP: Art by Javier Hernandez". His whole family is very supportive of my work, and his wife and daughter are true gems. Plus they always take me to the most mouth-watering food places in the city! Met up with several other artist friends on the floor, which always leads to some great talk about catching up with the latest goings on, as well as some neat discussions on art and craft. Nothing like talking to people in person, in this age of blogs, social networks and podcasting. I actually expected that my sales would have reflected the growth in size of the show itself. But in retrospect, judging by the amount of actual visitors to my table, it seems that the audience may not have grown as quick as the number of new exhibitors. Mind you, I don't have the figures for attendance versus last year, so it could be that mysterious variable at play here, the one where sometimes you just do better or worse one year than the other. By the time I tallied up my sales for this weekend, this definitely wasn't my weakest showing. I know I still have some room to improve in terms of making APE my most consistently profitable show year after year. Sunday was slow for me the first part of the day, which picked up in the afternoon. There was a flurry of sales near the very end of the show (among them, artist Brent Anderson and his family actually stopped by and bought some comics!). Talking to some of the other exhibitors, there definitely seemed to be somewhat of a softening of sales this year. Seems that the more inexpensive items sold better, which considering the still flatlined economy, is expected. I'll be curious to see at next year's APE if the amount of exhibitors increases or contracts (I'm guessing increases, judging by the number of conventions that are experiencing a growth in table sales). But I really want to see if overall there is a marked surge in attendees. But I will be back. This is still my favorite show to do. There are always new fans buying the books, the friendships I reconnect with once a year are always rewarding, the meals and times outside the convention hall are memorable. And the challenge to make new work, find the right mix of products to carry, will always draw me to the show. After a great meal at Taqueria El Farolito (where I had me a humoungous Shrimp burrito) we converged at Mitchell's Ice Cream, the only place for ice cream I wait outside in the cold, late night drizzle for, year after year. 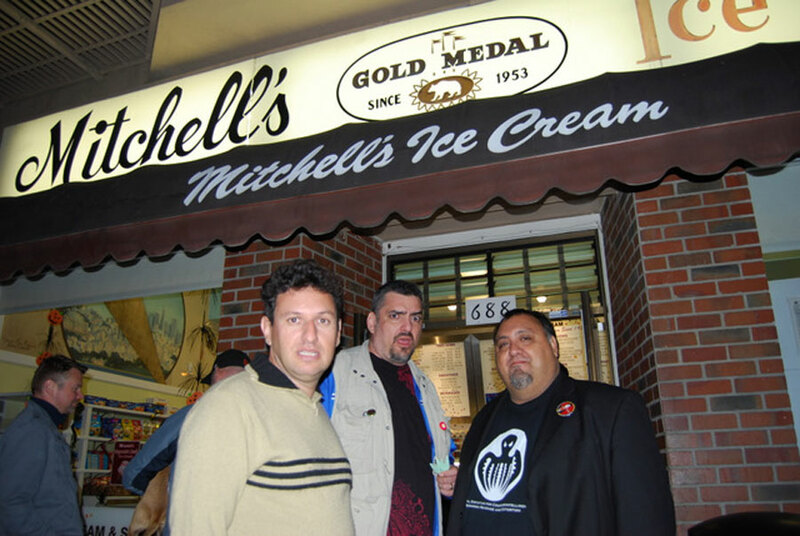 Michael Aushenker, Raul Aguirre and me. Raul, cartoonist and host of the MAN VS. ART podcast, was attending his first APE as an exhibitor. Michael was actually my carpool buddy for this trip. I think I've probably shared more rides with him to APE than anyone else. It's always a non-stop gab fest on the ride to and from LA, and the great times we have at the show always produce great memories, and great blog material! 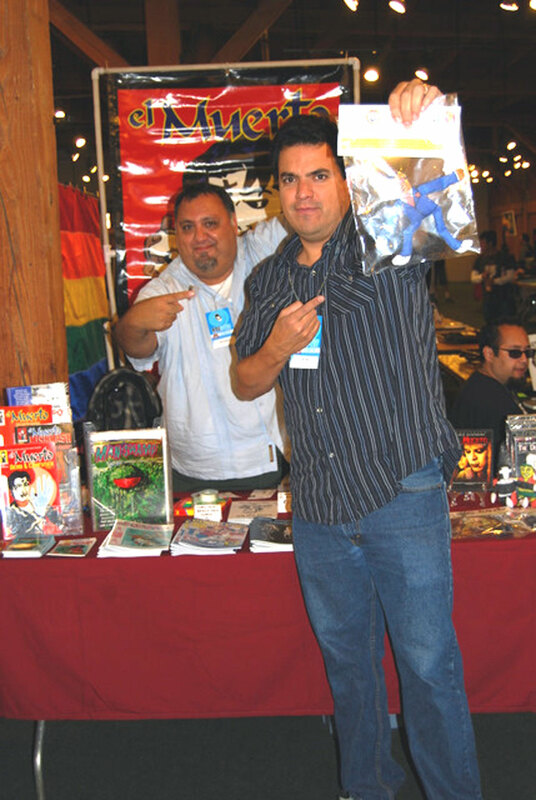 Labels: APE 2010, COMIC POP art show, exhibiting at conventions, independent comic book show, Jim Lujan, Michael Aushenker, Mitchell's Ice Cream, Rafael Navarro, Raul Aguirre Jr. I will be at the APE this weekend in San Francisco on Saturday and Sunday, Oct. 16 & 17. This is my 13th APE in a row as an exhibitor, having originally attended my first one back in 1996, when I went up on a fact-finding mission to learn about exhibiting at conventions, and eventually begin publishing my own comics. 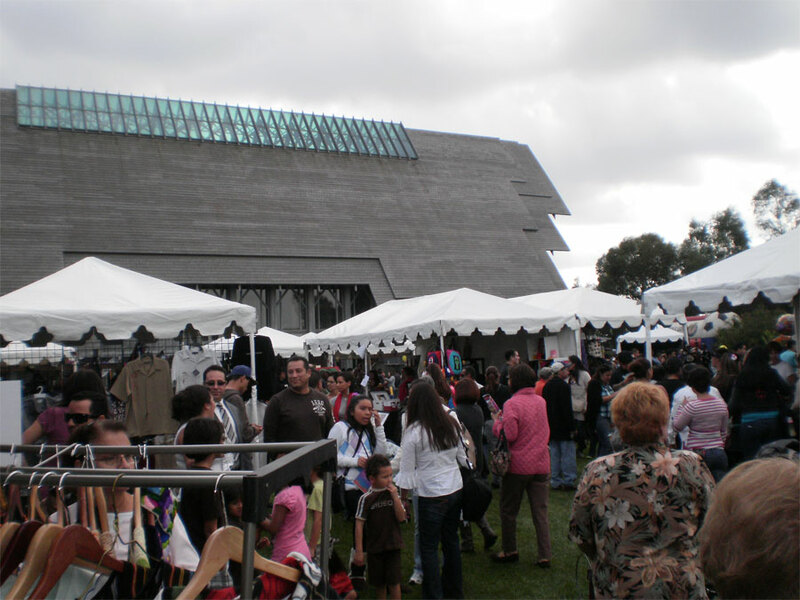 This past weekend, Oct 9 & 10, I was an exhibitor and speaker at the Latino Book & Family Festival held at Cal State Los Angeles. 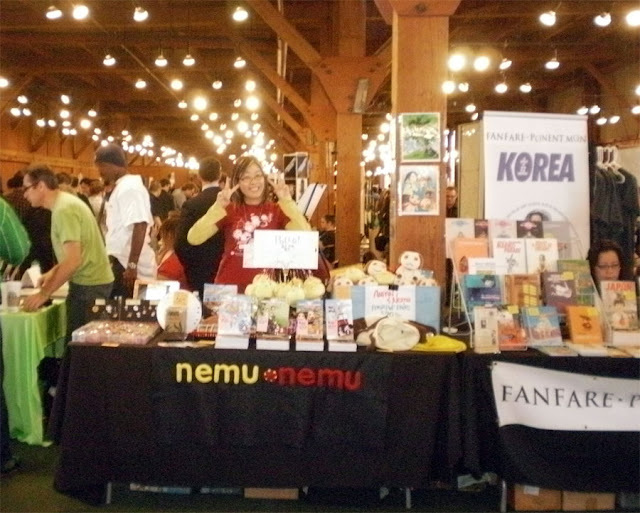 I hadn't attended the Festival as an exhibitor for about 8 or 9 years, so it was really nice to be back. I've previously written about a few events leading up to the Festival, but actually participating in it proved to be a real experience that I'm glad to have had. A few years previously we actually screened EL MUERTO on the same campus during the REEL RASQUACHE FILM FESTIVAL. The organizers had mentioned beforehand that this was the largest gathering of Latino authors in the history of the United States, so being a part of a special event like that is an opportunity to partake of. There was no shortage of attendees either, looking to meet favorite authors and discover new material to read. For me, this was the best of both worlds. 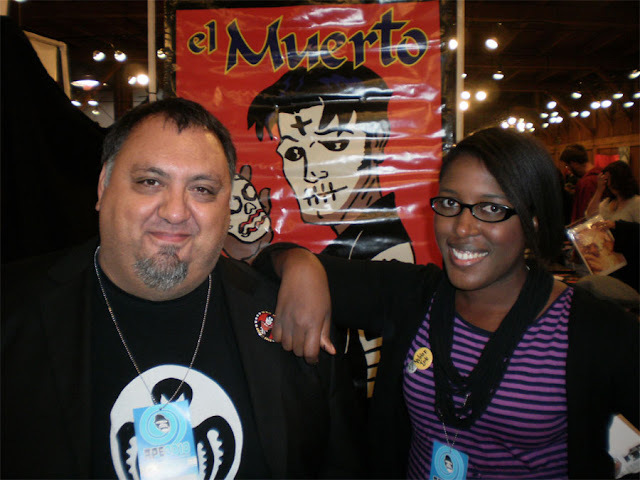 I had numerous people tell me that they had some of my earlier comics or had even seen the EL MUERTO movie, but I also had plenty of folks discovering me for the first time. It was really nice to see lots of parents bringing their children to the event, as that's such an important group to inspire and instill some literary aspirations into. 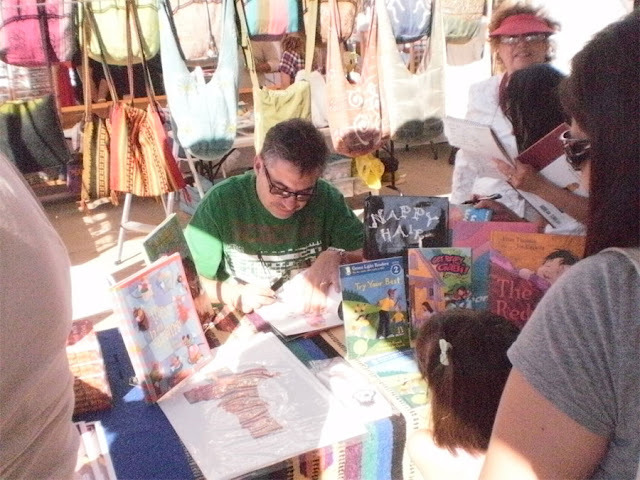 A lot of the parents asked about advice for their kids regarding cartooning and art. 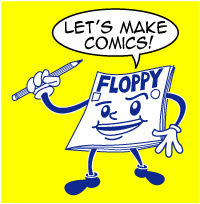 Sales, I'm happy to say, were very brisk at times, with comics, buttons and DVDs making their way to new readers. 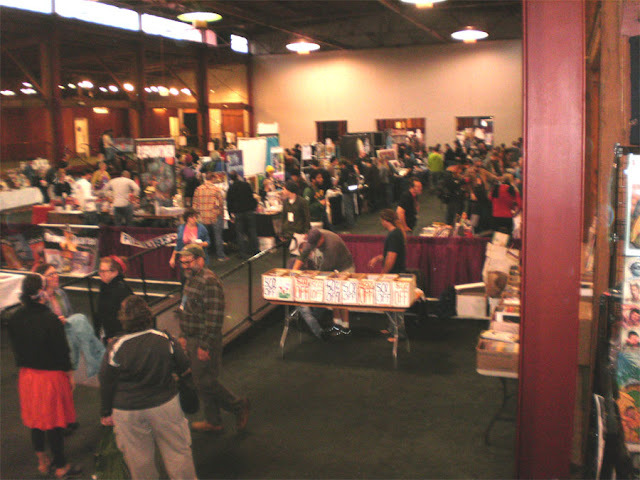 Talked to numerous educators and librarians as well, so the networking aspect of this type of show was in full force. I was on a panel Saturday afternoon with several other cartoonists, where we talked about everything from distributing our works, to what it takes to get one's voice out there. 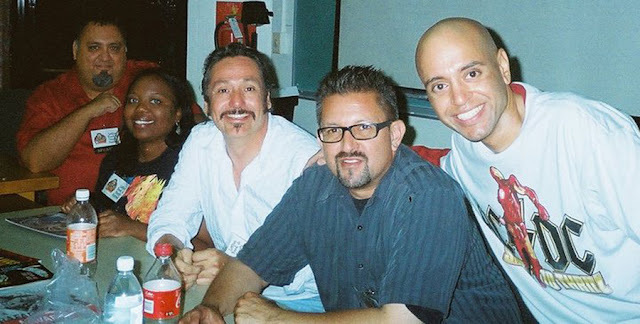 From L to R: Me, Dani Dixon, writer & publisher of '13', Rafael Navarro, creator of SONAMBULO, Lalo Alcaraz creator of LA CUCARACHA and Philip Victor, writer and publisher of JAGUAR SPIRIT. There was a real good turnout for the panel, with some of the questions specifically aimed at self-publishing. People want to get their personal voices heard in the comics world, which is something so many of us strive to encourage people to do. 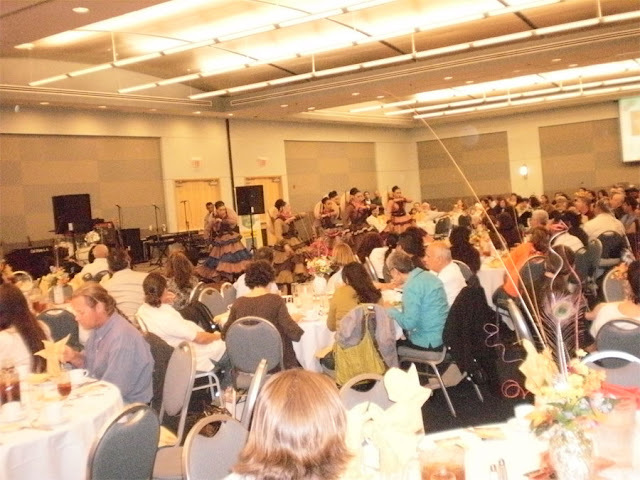 Later that evening we all attended the Dinner with the Authors gala. Lalo actually MC'd the event, with the remaining four of us cartoonists meeting up at the same table. 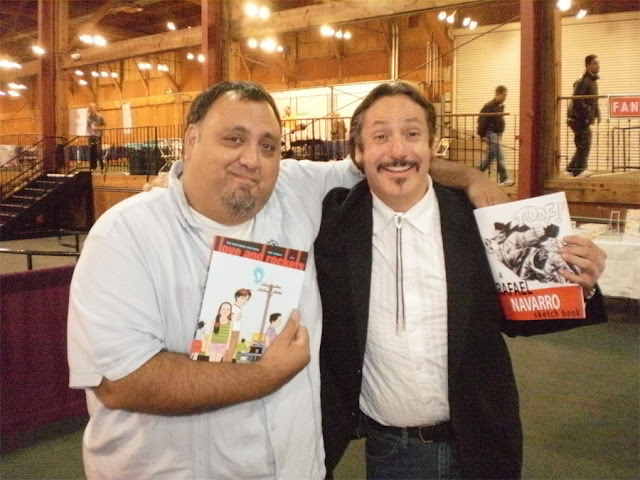 At one point during the evening, Lalo pointed to our table, mentioning his 'cartoonist friends'. Even Edward James Olmos, founder of the Festival, pointed us out. In a room full of authors and novelists, it was nice being pointed out as the sole cartoonists in the room! 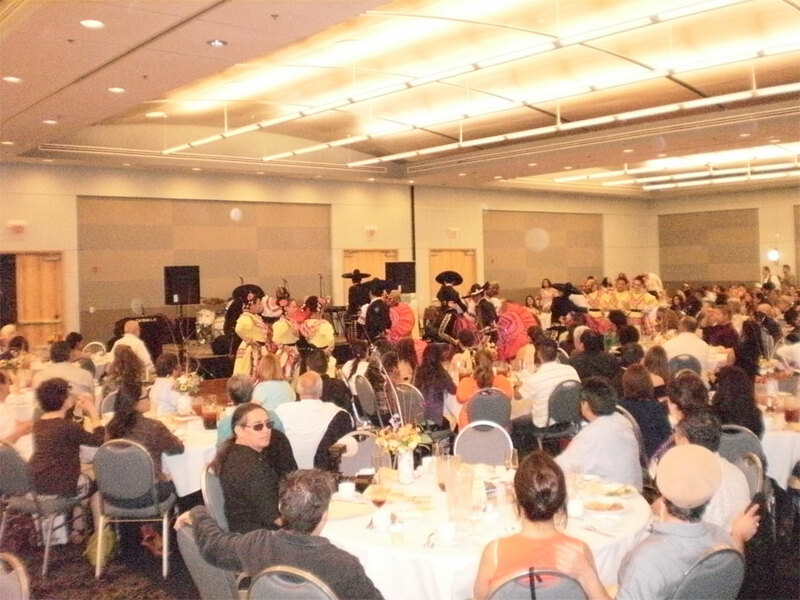 There was about an hour or so of music and folkloric dancers while we enjoyed our food. Definitely a different feel to the usual comic book conventions I attend! Honestly, I had such a great time that evening. 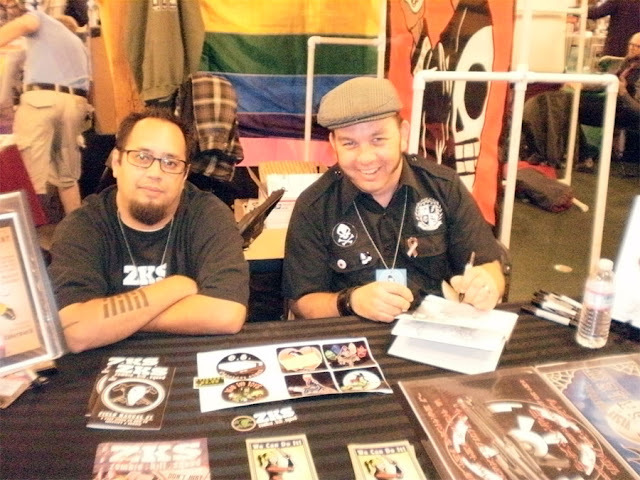 Over the past 13 years or so that I've been publishing my comics, I've attended numerous events. But this evening, with it's celebration of Latino American voices in the arts, and the music and dancing, gave me a reaffirmation of my perspective as an artist. Providing an artistic point of view, fueled in part through my Mexican-American identity, makes me grateful to be able to do what I choose to do. 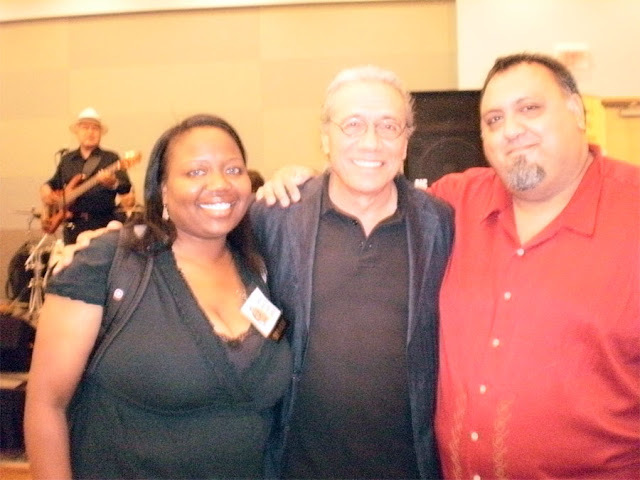 Dani Dixon and me with Festival founder Edward James Olmos. Edward's dedication to Latino literacy is so deep and sincere he inspires me every time I hear him address the cause. 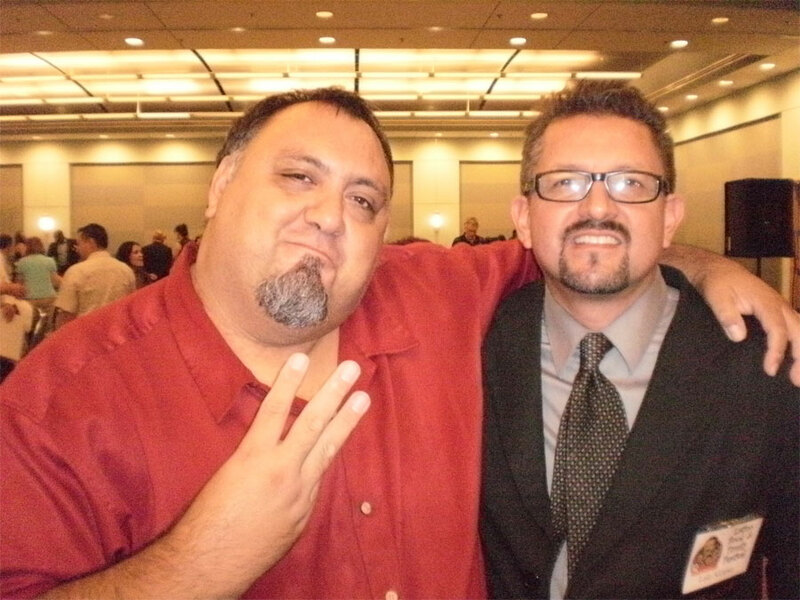 Me and dinner MC/cartoonist Lalo Alcaraz. 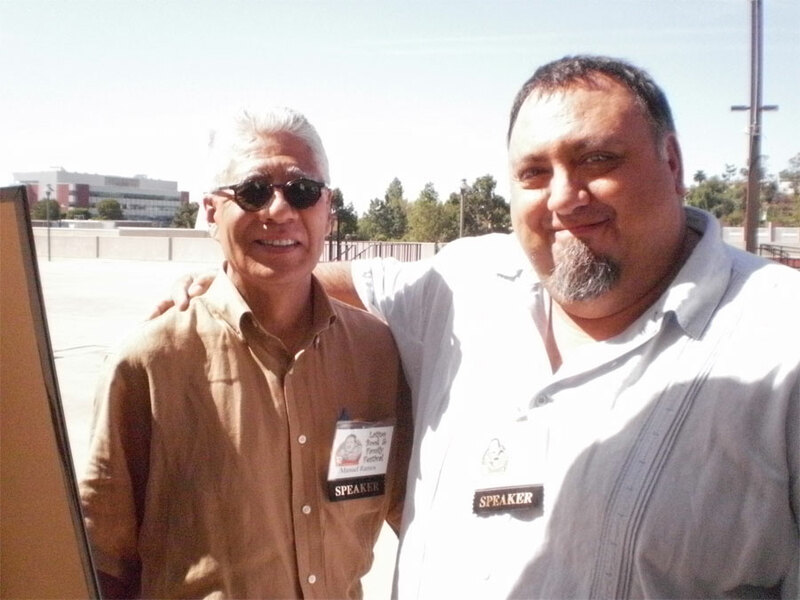 I've known Lalo for some 10 years or so, and in fact he's always been a supporter of my work. One year he wrote about me in his LA Weekly column he used to write, and I've been on his radio show, The Pocho Hour of Power, a couple of times. Rafael Navarro, creator of Sonambulo. Me and Raf have been in this self-publishing game since the late 90s, and it's been one hell of a long, winding mindtrip since! This was actually the first time in several years that he and I actually shared a booth at a convention, and it felt like 'the good ol' days'. 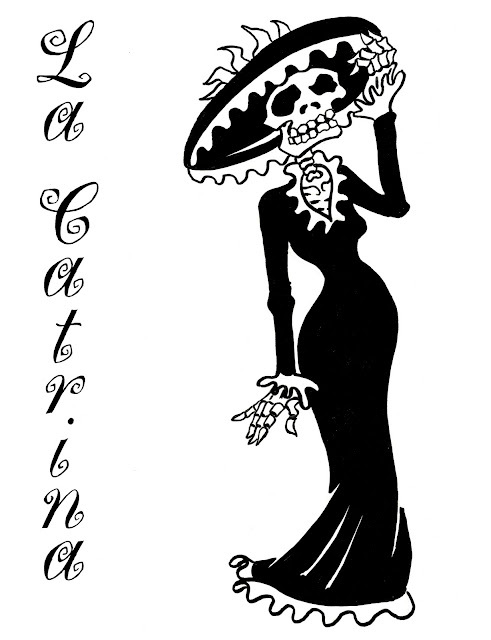 With our two characters, a masked Mexican wrestler and an Aztec zombie, we have a very particular niche corner of Mexican folklore and pop culture covered. And of course, our two-man rapport we have with the fans always means our booth is hopping with chit chat and drawings galore. Manuel is a lawyer, and among the books he's written are some crime stories featuring his detective Luis Montez. 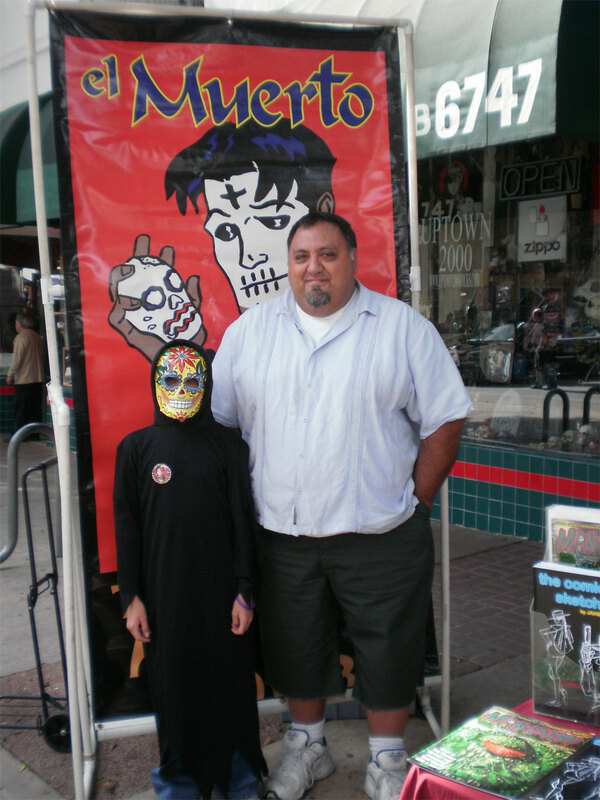 He picked up a copy of El Muerto, for which I was happy to sign to him. One thing I kept thinking to myself all weekend was: "Why the heck has it taken me so long to get back to the Latino Book Festival?". I am definitely going to add this event to my yearly must-do shows. It's far to rewarding to me in many ways, and also it was announced that Cal State LA has committed to becoming the permanent home for the Festival, so it's a short drive to attend to. My thanks to Reyna Grande, the Program Director, and to Philip Victor, for telling Reyna about me in the first place. As part of the Latino Book & Family Festival's commitment to serving their community, I'll be giving a free reading/drawing demonstration at the Pan American Bank in East LA on Dec. 4 at 12 noon. 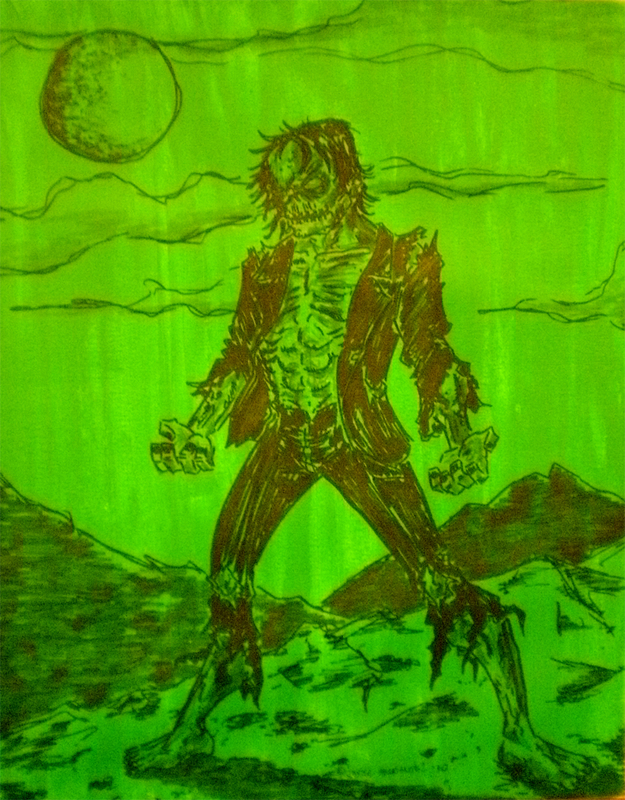 Had a great time last night at the Opening to my solo art show, 'HAPPY, HAUNTED HALLOWEEN' at GEEKS Comics in Whittier. Thanks to the folks who came out to get their Trick or Treatin' on early this year! I actually spent more time talking about the individual paintings with people than I usually do. Seems like the attendance was more spread out than usual, with people coming in at various points throughout the evening as opposed to all showing up at the same time. I took way less photos than I usually do at an event, and regrettably the ones I did take I wasn't too happy with. Thing is, my camera (or at least the settings I had it on) can take lame pictures sometimes. 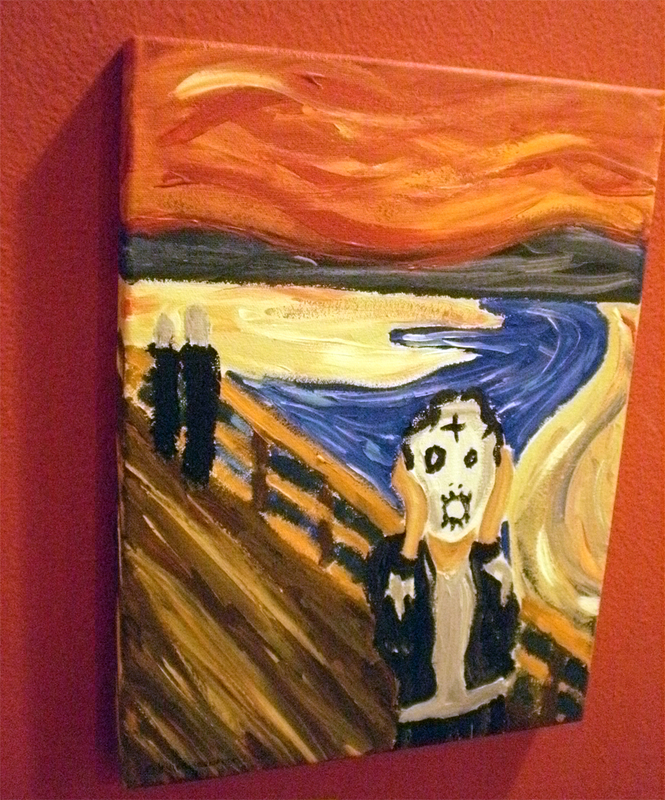 In this case, the lighting on the paintings was really poor. So, I picked a few pics to share here, after some tinkering around in Photoshop. I'd much rather show you photos that better capture the vibrant colors, but I thought I could at least share some here for the sake of the post. Both of these, as well as Michael Myers 'Halloween' painting, were created by painting a canvas with only one color then drawing in an image in markers. 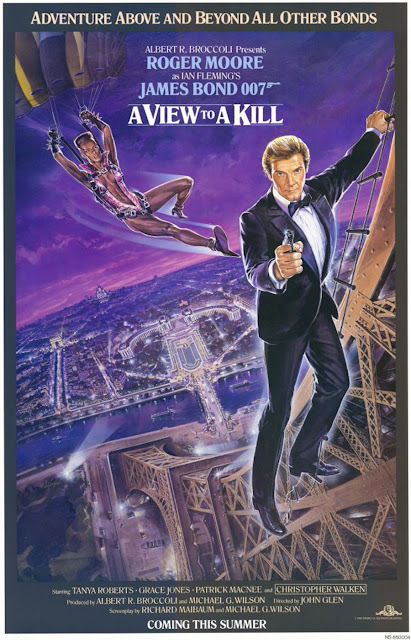 I've seen old movie posters or paperbacks done in a similar style where there is one color for a background and a high contrast, black inked drawing in the foreground. Again, I don't feel the photo I took properly captures the intensity of the color, but I was really happy with the drawings, both done in different styles. Well, due to the fact that my computer is currently in the repair shop, I have to cut this post short. Sorry for any inconvenience! I'm finishing up this post on a friend's computer and I don't want to take up their time. 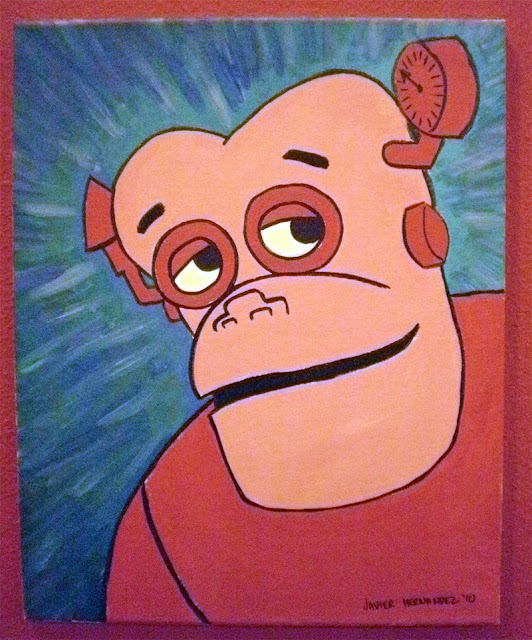 My art will be on display at GEEKS Comics until Nov. 4, so please stop by and check out the art. And don't hesitate to add an original Javier Hernandez painting to your collection!